I’ve been a big fan of Joseph Phelps wine for a long time and I was pleased as punch to see Wine Spectator name the 2002 Insignia wine of the year for 2005. The insignia is a great wine. I have a bottle of the “off year” 2000 in my cellar. I’m waiting for a special occasion to drink that 92+ point wine. Perhaps not quite the same caliber but certainly a perfectly quaffable wine is the Phelps Innisfree cabernet sauvignon. I recently opened a bottle of the ’04 vintage. For about 1/4 to 1/5 the price of the insignia you can spend only $25 for this really excellent wine. 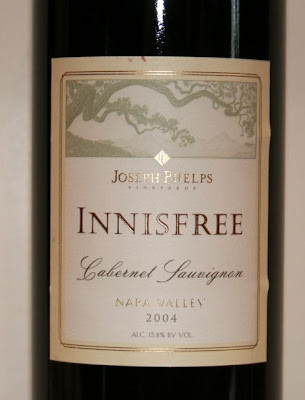 I’ve had several vintages of the innisfree and have enjoyed them all. I generally love this wine but I have to say I was a little disappointed in the body on this one. The nose was very nice with presentation of mocha, cherry and a hint of smoke. It was medium bodied on the palate with sweet strawberries and cherries. It had a lot of new world red fruits, soft tannins, and the mocha flavor came through nicely on the upper palate. It finishes long and smooth but it was a little bit awkward on the end. There were slight hints of maybe rotten tomatoes? I guess I just was expecting a heavier, satiny body that I’ve had before in the innisfree. Still, it’s a 90 point wine for sure and we didn’t waste a drop.